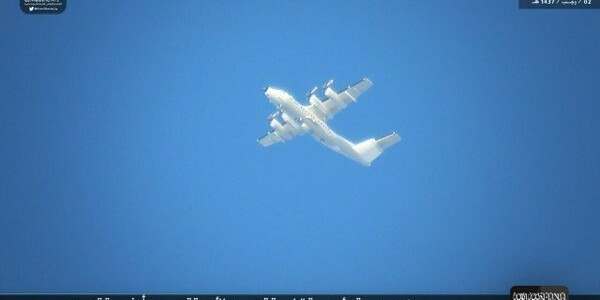 On April 10, Libyan militants looked up and caught a glimpse of a white spy plane flying over the city of Benghazi. The aircraft’s appearance comes as Washington mulls how best to support Libya’s weak government and fight the terrorists taking advantage of the chaos. The Islamist group Ansar Al Sharia — linked to Islamic State since March 2015 — released, via social media, a photograph of the aerial spy. 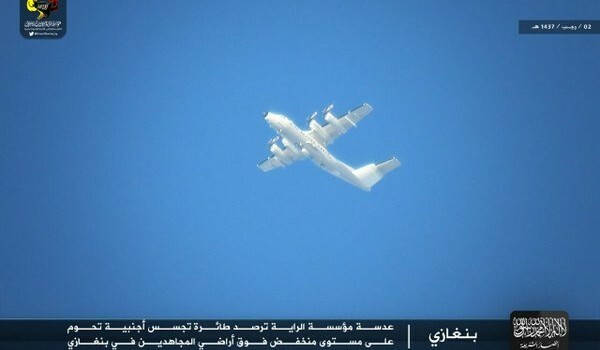 The plane appears to be a U.S. Army EO-5C Airborne Reconnaissance Low, although the picture quality is too poor for us to be sure. Back in November 2014, Libyans spotted the same plane — or at least one that looks very much like it — in the same area. On Feb. 19, the plan came into the public eye when American fighter-bombers attacked an Islamic State training camp near the town of Sabratha on the opposite side of Libya as Benghazi, fewer than 100 miles from the Tunisian border. Although the Pentagon disagrees, the strike may have also accidentally killed two Serbian diplomats the terror group was holding hostage, according to authorities in both Serbia and Libya. Since Western-backed rebels overthrew dictator Muammar Gaddafi in 2011, the North African country has suffered perpetual instability and violence. Washington’s worst mistake during that intervention was “failing to plan for the day after,” Pres. Barack Obama said in an interview with Fox News on April 10. After its meteoric rise in Iraq and Syria in 2014, Islamic State made connections with other Sunni extremists across the Middle East, Central Asia and Africa. Washington estimates that Islamic State has between 4,000 and 6,000 fighters under its command in Libya, most of them scattered along the Mediterranean coastline. To find targets and keep up the pressure all while limiting its direct involvement, the Pentagon has quietly employed spy planes and drones, along with secretive commando teams on the ground. To further downplay their deployments, the U.S. Air Force and Army both use planes with civilian-style paint jobs that help them to blend in at airports in the region. The four-engine, all-white aerial spook is exactly what one might expect to see as part of this so-called “small footprint” approach. But it’s not entirely clear who’s flying this plane over Benghazi. As of October 2015, the Army had eight EO-5C spy planes, according to an official briefing. Based on the De Havilland Canada DHC-7 passenger plane, these aircraft have powerful cameras and specialized gear to track and listen in on enemy communications. One regularly deployed to Africa, including trips to Uganda’s Entebbe Intentional Airport, according to the Army’s presentation. But the airport is a hub for American operations in Central Africa rather than North Africa. And the photographs that exist of these planes generally show them sporting a white color scheme with a red line down the center of the fuselage and up the tail, instead of a plain white scheme. To keep up appearances, the EO-5Cs have U.S. civilian registration codes on their sides instead of military insignia. Photographs do exist of two apparently similar aircraft bristling with antennas and domes, but without the stripe. Aviation spotters in Europe have captured both N176RA and N566CC in a white-and-light-gray scheme that would be hard to discern from all-white in the pictures from Libya. However, in July 2015 — as a part of a maintenance contract — the Army released a table accounting for all the EO-5Cs and their registrations. The registration numbers for the two light-colored DHC-7s do not appear in the document. FlightGlobal’s Ascend aviation information tool does show the ground combat branch as the owner in both instances, but offers no clues as to which unit might operate the planes. A similarly murky case came up in March, when a smaller, twin-engine Beechcraft Super King Air spy plane belonging to the Army crashed in Iraq. Similar digging turned up equally little information on that civilian-marked aerial spook. Whoever is behind the controls may soon have more work to do. On March 30, Libya’s internationally-recognized Government of National Accord returned to official offices in the capital Tripoli for the first time in nearly two years. After a disputed election, the United Nations-supported authorities had fled to Tobruk. The newly-reorganized central government is shaky, at best. And just in case, the Pentagon has drawn up contingency plans to hit more targets in Libya, according to The Washington Post. Another intervention could compel the Defense Department to send more spy planes and commandos to Libya.